Home / Sports and Leisure / Bike Cave – bike tent – bike storage shelter – new improved design! Update – September 2018 – we have just launched our new improved Bike Cave. We have enhanced the design, having listened carefully to customer feedback over many years. First thing to note is that we’ve changed the fabric to a new heavy duty, woven plastic material. This is much tougher than our previous polyester material. 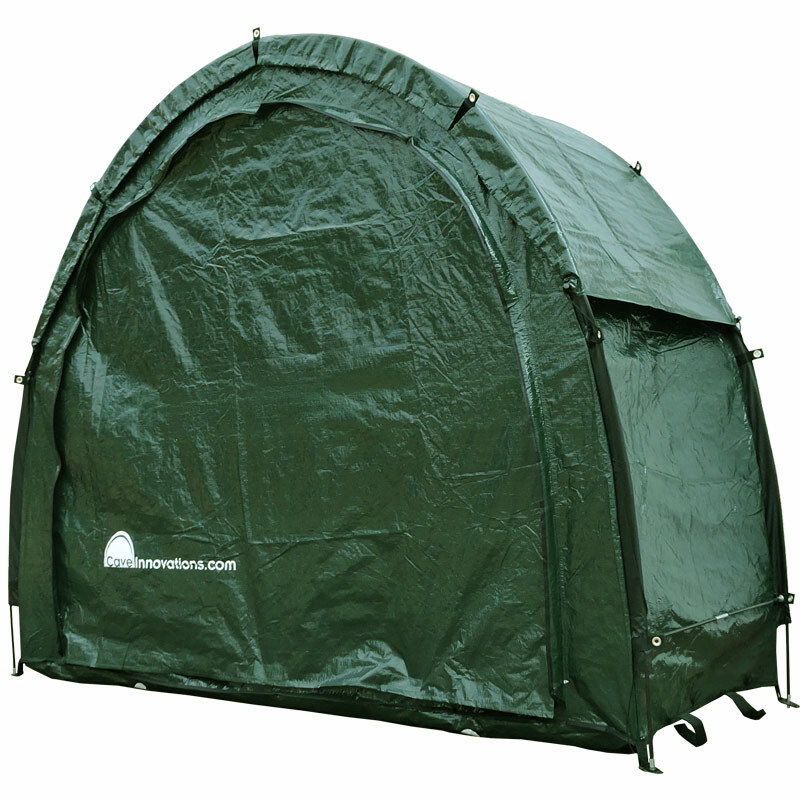 It’s made of a woven, rip-resistant polyethylene (PE), a high grade tarpaulin-like material which is both durable and waterproof. Fundamentally the size, shape and appearance remains the same, so that the rain just rolls off. You’ll notice that we’ve also now incorporated an additional PE “second skin” roof hood, which fits over the top of the main cover and hooks onto the eyelets along the arch shaped sides. 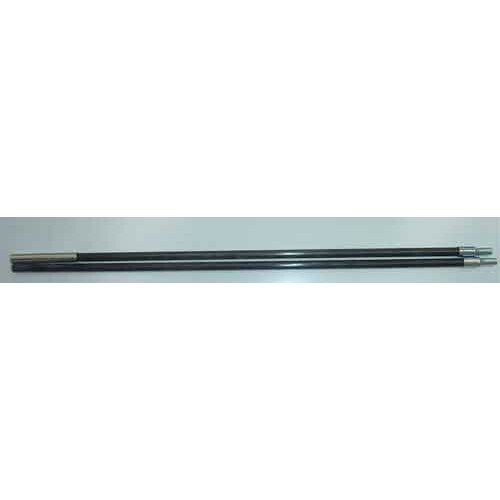 A draw string nylon guy line allows it to be tightened and optionally can be pegged down for additional stability in high winds. This new fly sheet or “roof hood” not only makes the Bike Cave more waterproof but also extends the lifetime of the product. Most people understand that any fabric based product in continuous external use will over time fade and degrade. This is due to the sun’s damaging ultra violet rays. Our new design additional roof hood counters this problem. In the past the fabric of the previous Bike Cave design would sometimes degrade, typically after a few years and would eventually tear at the apex of the main fabric cover, where most of the sun’s UV exposure was concentrated. With our new design, instead of having to purchase a complete new replacement cover, you can now simply purchase a replacement roof hood, thus significantly extending the products longevity and making it an even more cost effective storage solution for your bikes. Another improvement is that we’ve also changed the shape of the door panel. The new door panel shape makes it easier to zip and unzip without snagging. Even though the door shape has been modified, the Bike Cave is still modular. If you want to increase the depth of your bike cover you can still extend its size by purchasing and attaching a new style TidyTent Xtra. We’ve also changed the base from a plastic groundsheet to a tough mesh floor panel. This improves air circulation to reduce internal condensation and allows any water ingress to quickly drain away. 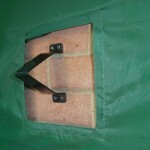 Finally, you’ll also find we’ve incorporated an additional foldaway groundsheet extension strip along the front edge. We’ve noticed that it can sometimes be difficult to zip or unzip the door panel with one hand when you’re trying to hold onto your bike with the other. So, by placing your foot on this handy new “tread strip” you can create more tension in the fabric making it easier to use the zip with one hand. It also makes for a neater edge and reduces the risk of damage to the product when mowing the lawn. If you prefer not to use it, no problem, just tuck it underneath out of the way. 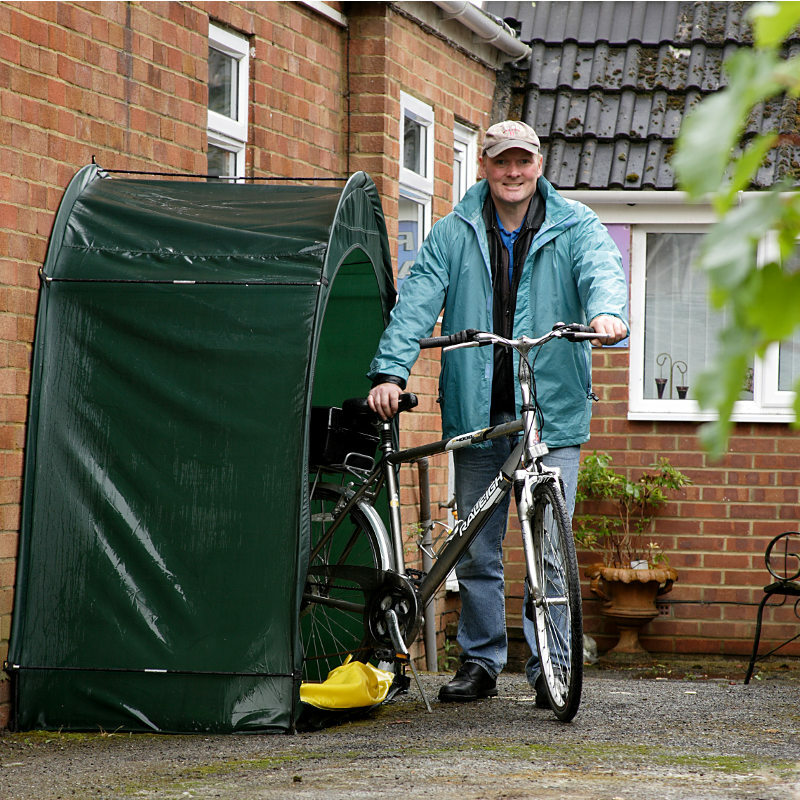 So, welcome to our innovative bike tent, the Bike Cave ® (or BikeCave ® ), a convenient and cost-effective bike storage solution for your back garden or yard. 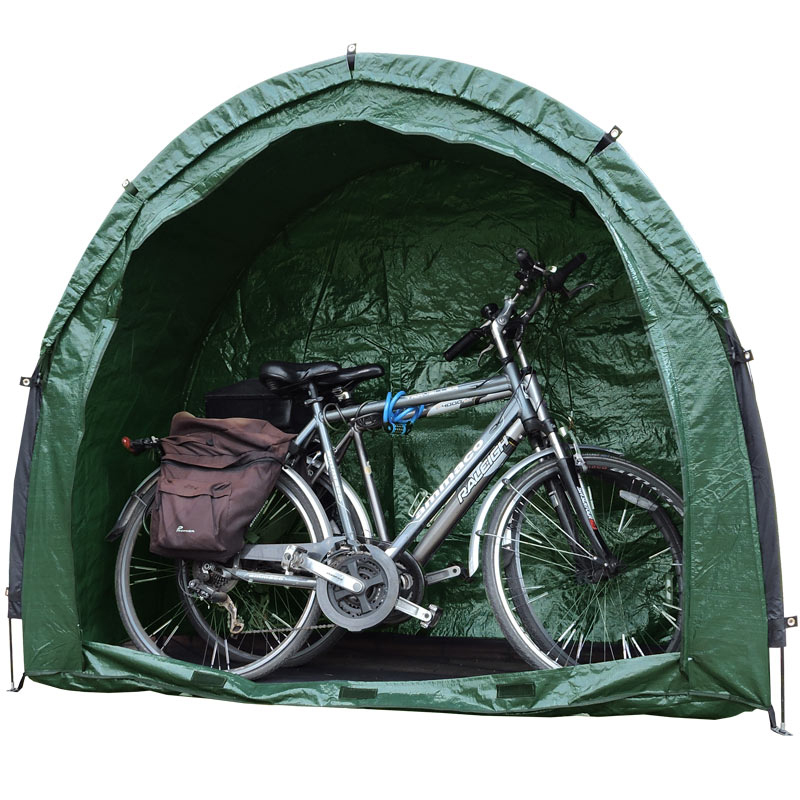 Our hugely popular Bike Cave is a trade mark registered and patented bike tent with international registered design rights. As cycle enthusiasts ourselves, we designed Bike Cave from the start to be big enough to house 2 – 3 adult size bicycles. We researched the use of many different materials including plastic, wood and metal. But eventually after trialling many different bike storage solutions, we settled on the concept of a bike tent. Prior to Bike Cave no one had ever considered the use of bike tents as a means of providing an effective bike shelter. Introducing the concept of a bicycle tent as a means of storing your bikes raises the obvious question of security of its internal contents. But as a partner product to the Bike Cave we also invented the optional Anka Point bike storage security bracket. The Bike Cave has a rear flap through which you can attach the AnkaPoint to a wall or fence, with it’s specially designed one-way anti theft security screws. Once installed you can then feed a cable lock or chain through this hardened steel bracket and around your bikes to protect them from theft. Note: Anka Point is generally sold as an optional accessory to the Bike Cave. 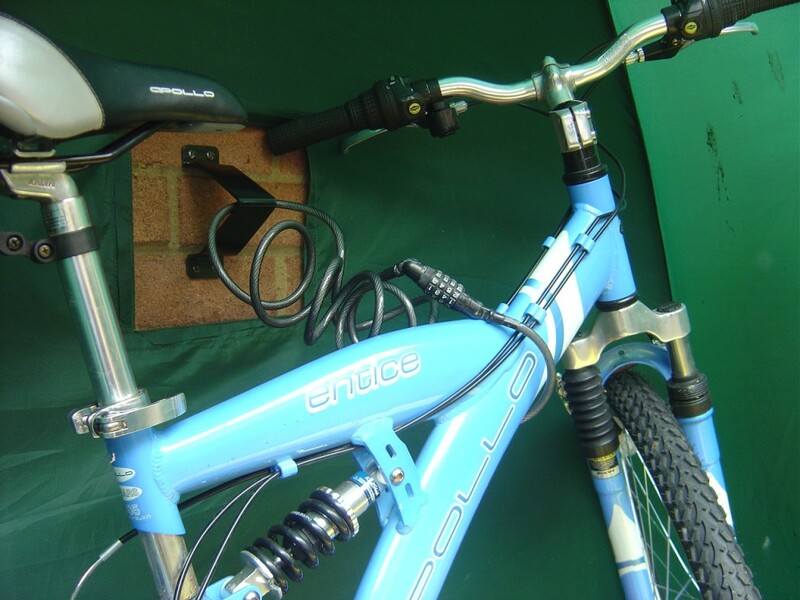 Secure your bikes with Anka Point to a wall or fence through the rear flap of your Bike Cave. Historically, there haven’t really been many options for bicycle storage other than locking it away safely in the shed or garage. Some people have even been forced to store their beloved bike at home in their hallway or porch. The problem is that once safely tucked away, bikes can easily become inaccessible, as other stuff is piled in front of them. Over time your good intentions of cycling more regularly are soon forgotten. The very idea of a bike tent as a means of storing your bike has taken a while to become accepted. The Bike Cave is designed to keep your bike dry and readily accessible. Where do you actually store your bike? Can you get at it without tripping over it? In recent years we have all seen a massive growth in cycling. 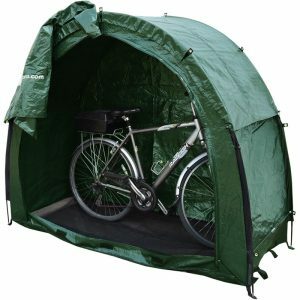 Bikes are more popular now than ever before and bike tents are becoming the obvious answer to the question of where to store your bikes. Do you like to take your bikes on holiday when you go away in your camper van, caravan or motor home? Well, the Bike Cave can be quickly and easily set up to create a perfect shelter for not only your bikes but all that other paraphernalia and clutter you seem to end up with. It’s also a great way to “reserve” your pitch while you’re away from the site during the day. Check out this fun video and see how these amazing bike tents are just popping up everywhere! 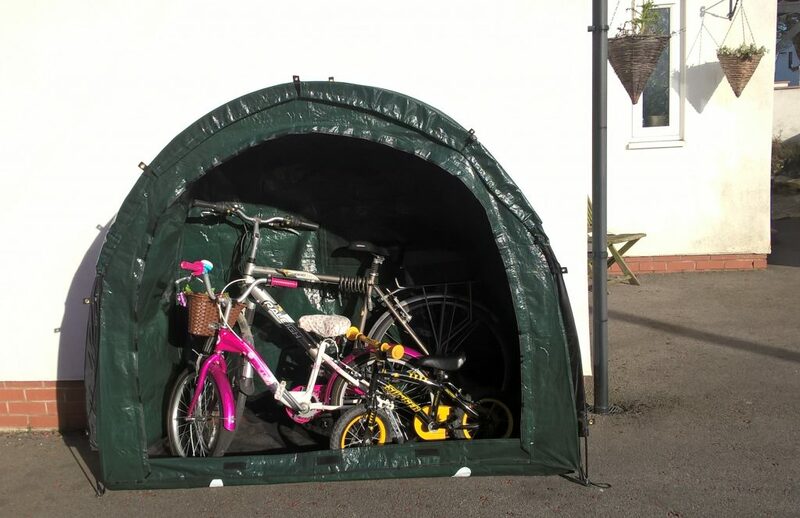 Our innovative bike tent bicycle storage solution can be installed free standing or neatly integrated into your garden, up against a wall or fence. A purpose designed “home for your bike”. If you install it free-standing, we suggest you lay some old paving slabs on the internal mesh groundsheet and also peg or screw down with the pegs and guy lines included. Obviously if you choose to set up your bike cave freestanding, there’s no wall or fence to lean your bikes against. However, this is not necessarily a problem providing you purchase a bike floor stand. To stand your bikes upright you can insert one of your bike’s wheels into a bike floor rack or stand. These are relatively low cost and available at most cycle accessory shops. You can also feed a cable lock or padlock and chain through the stand as an additional theft deterrent. 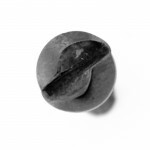 If you install against a wall or fence, simply screw through the eyelets around the outer edge to the wall or fence with plastic wall plugs and screws. 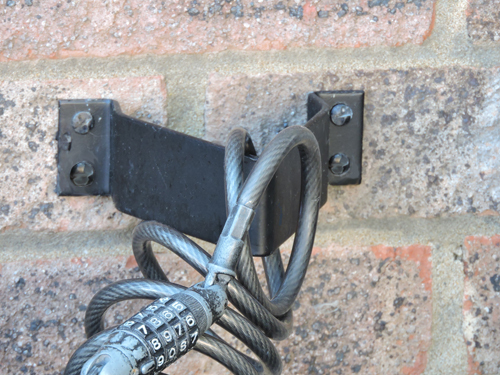 When installed against a wall or fence you have the advantage that you can install the optional AnkaPoint security bracket through the rear flap to create a security anchorage point – as explained above. Head of our one-way anti theft security screws – warning – creates a “permanent” security solution! 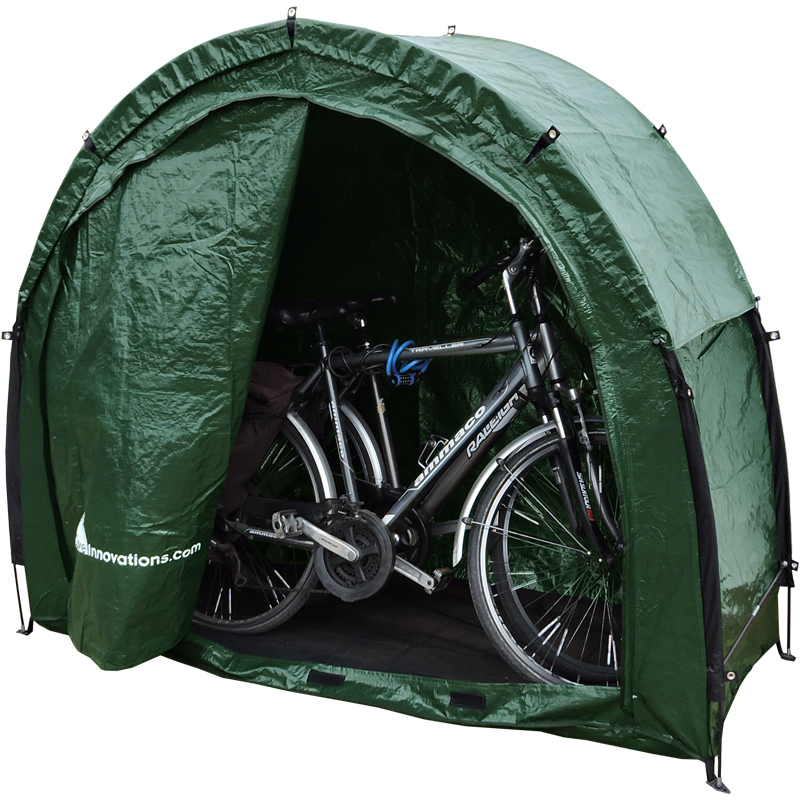 Designed to be quick and easy to set up, the Bike Cave bicycle tent has a detachable zipped front panel offering you the choice of leaving the front open or closed. Very useful in the summer when rain (in theory) is less likely and access is required most frequently. While the BikeCave provides a neat, dedicated and dry place for you to store your bike(s) – combined with our unique security bracket, the Anka Point, the Bike Cave bike tent can be as secure as you like. The Bike Cave has a small access flap in the rear panel, designed specifically with the Anka Point in mind. The Anka Point with its clever, one-way security screws provides an ‘anchor point’ to which you can confidently chain your valued bike(s). 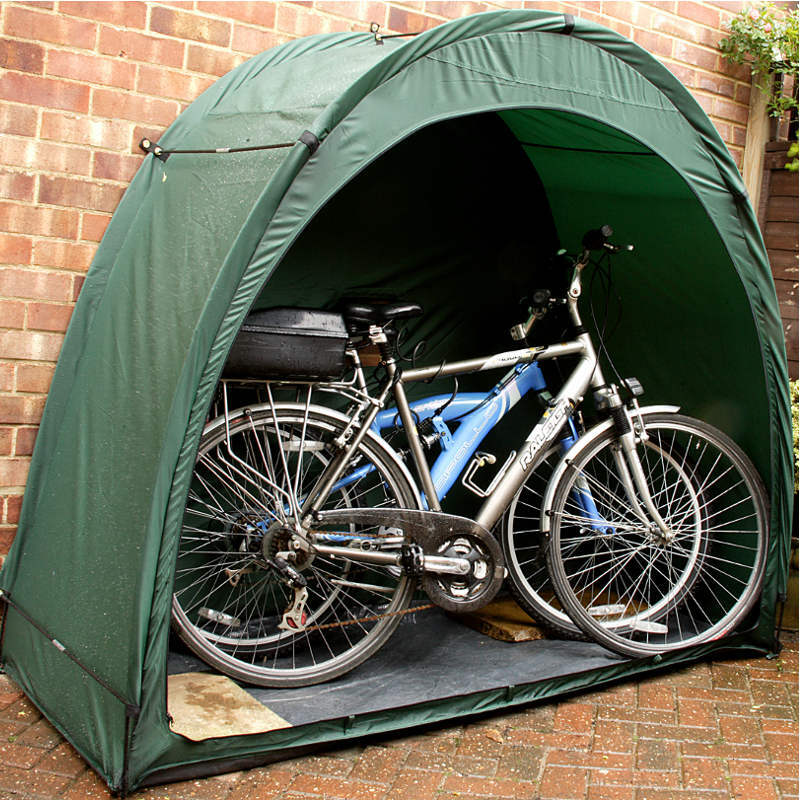 A safe and secure, dry and dedicated storage place for your bikes – the Bike Cave is just what you need! Note: this product is marketed under several brand identities, targeting different market sectors. 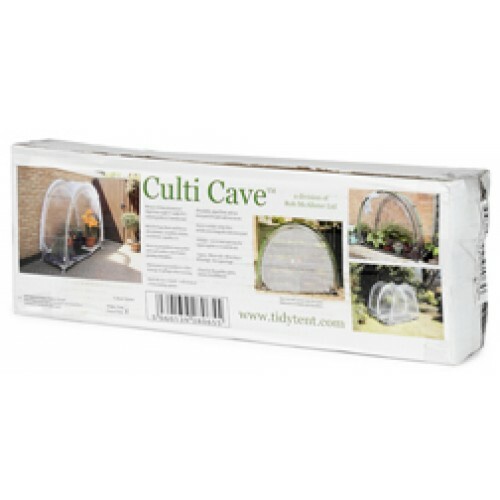 You may also come across it under the names of Tidy Tent and CampaCave. TidyTent, Tidy Tent, BikeCave, Bike Cave and CampaCave are all registered trade marks. The design of our bike tent is protected by European Community design registration and many international patents. This product was invented and created by Rob McAlister. 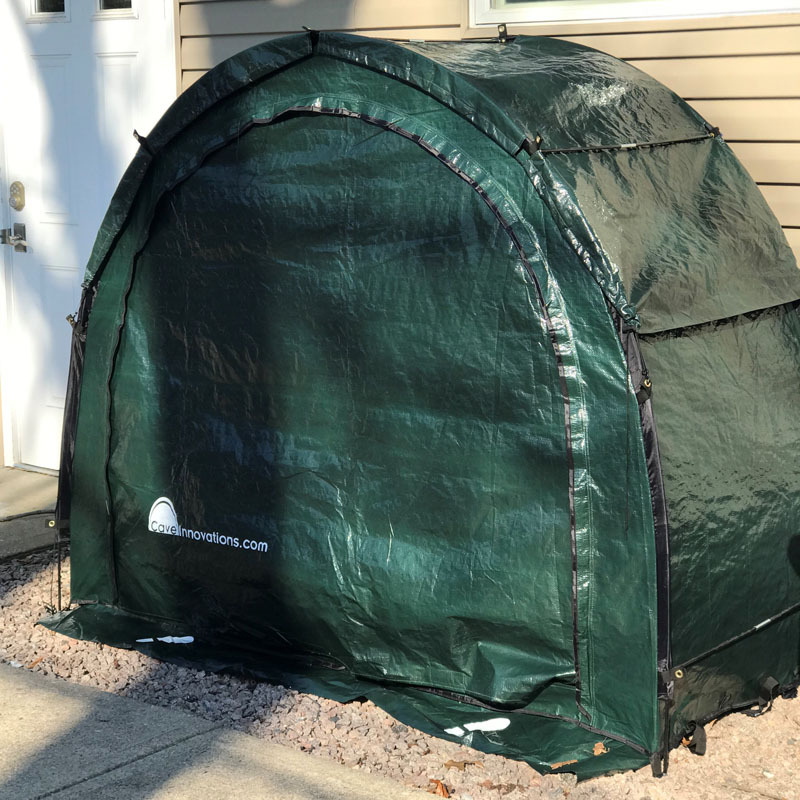 Cave Innovations is a division of Rob McAlister Ltd.
We have sold many thousands of our bike tents and have thousands of delighted customers, however it is important to note that bike tents do have some limitations. 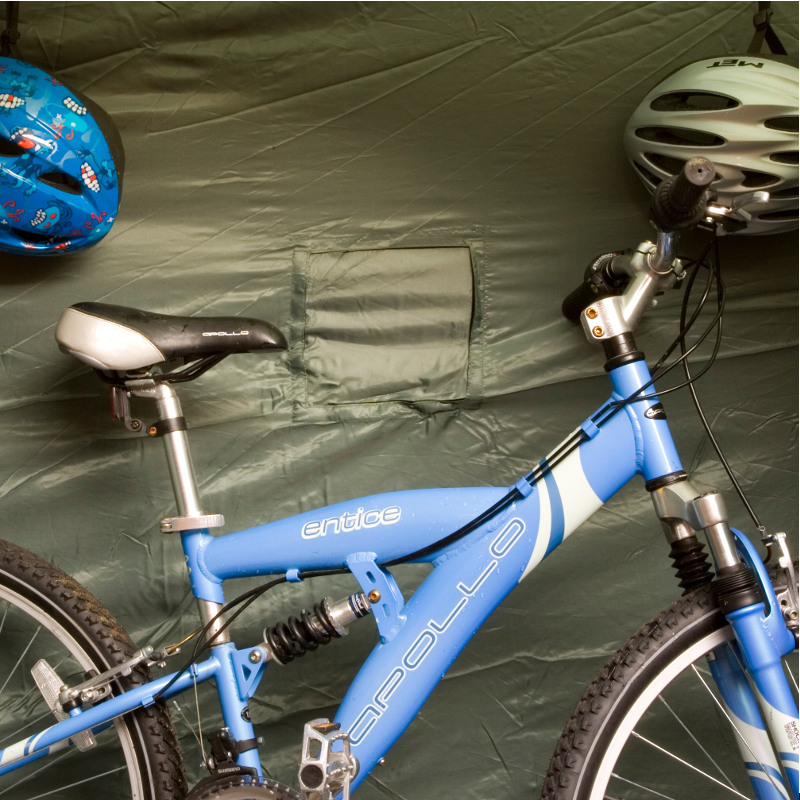 Our bike storage tents are made from a tough hardwearing and durable PE polyethylene. 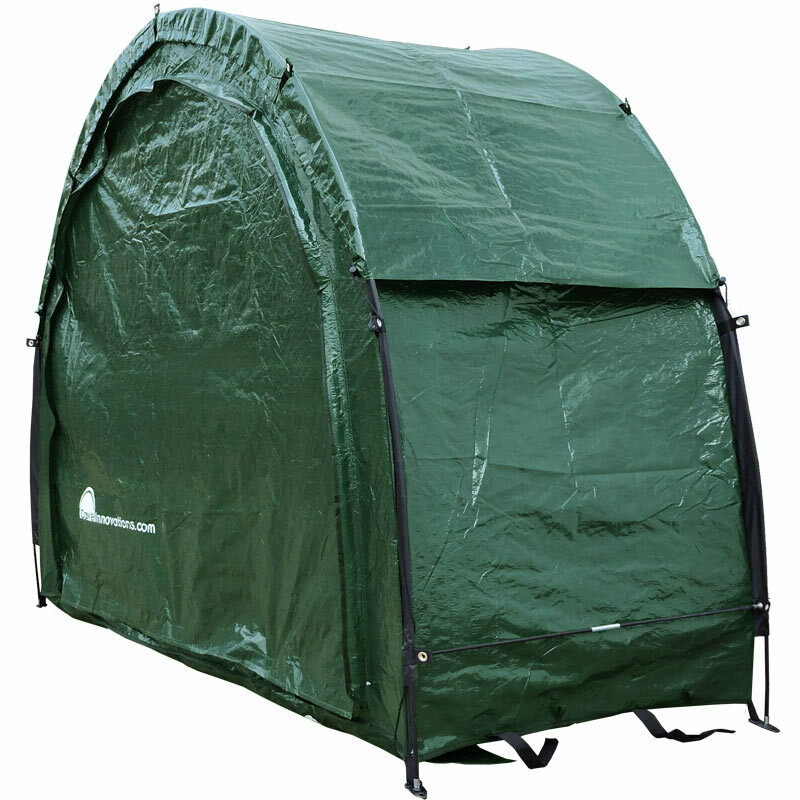 The bike tent’s design also includes a protective flap over the zip to limit the possibility of water ingress. Whilst every attempt is made to ensure these bike tents are as watertight as possible we do not guarantee that they are 100% waterproof. N.B. The newest version of the BikeCave (post September 2018) is now supplied with a replaceable roof hood to improve waterproofness and UV protection. Thus the longevity of the product may be extended. At the first signs of significant fabric degradation, you can now purchase a replacement roof hood rather than a whole new cover! As with any tent structure, dependent upon the extent of inclement weather, there can sometimes be a small amount of ingress of rain water or condensation. 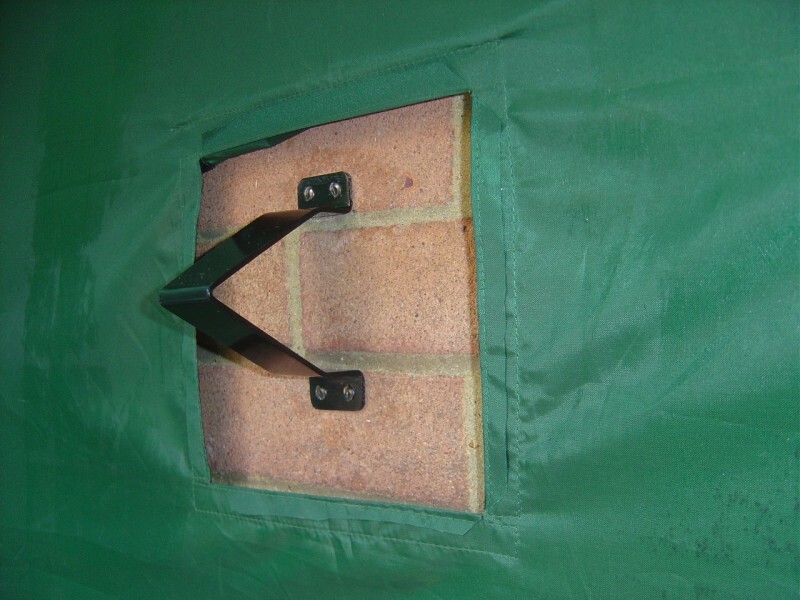 Should this occur, the mesh groundsheet is designed to allow any water ingress to drain away quickly and effectively. 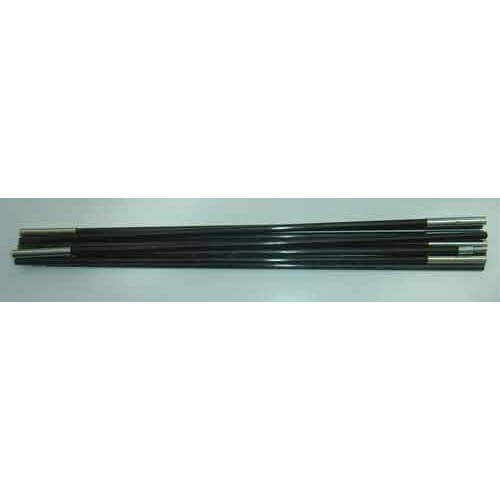 Please note there is a limit to how much weight the bike tent’s fibreglass rods can withstand. The product really should not be used in snow. It is certainly not designed to withstand heavy snowfall. If you do use in snow then clear the snow off regularly to keep snow build-up to a minimum. Damage to the product as a result of use in snow is not covered by warranty. Please also note that over time it is possible that the fabric of your bike tent may fade in sunlight. Please note: this product is manufactured from a durable, hardwearing plastic however we make no guarantee as to the longevity of the product since wear and tear will vary very significantly depending on installation method, Ultra Violet (UV) exposure, temperature variation etc. 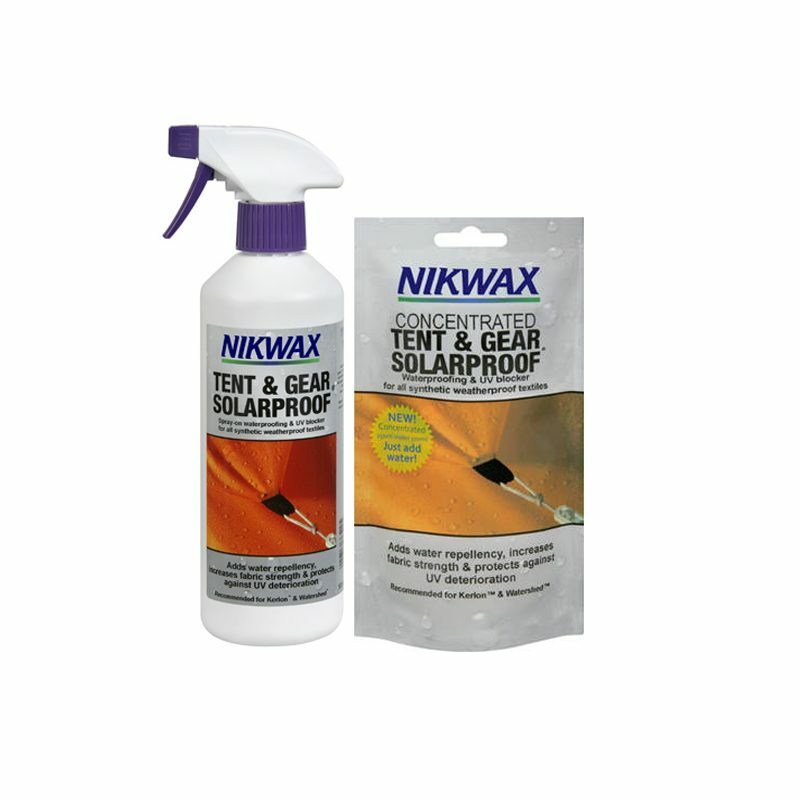 For older pre-September 2018 models, made of polyester, we recommend Nikwax Tent & Gear Solarproof/Water proofer. One spray can double the effective life of fabric and make it more durable, and is suitable for a variety of products and appliances. Click here for more details. Note: Nikwax is not required for our new PE polyethylene model, now supplied with replaceable roof hood. The door panels of the Bike Cave can be completely detached if required. The zip is not a single zip but two zips, each going half way round. 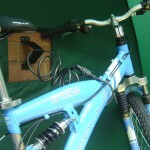 The zips are configured such that one zip has the slider on the door panel itself, whilst the other zip has the slider attached to the body of the bike tent. 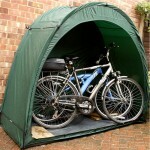 The modular version of the Bike Cave is known as the TidyTent Xtra. This has both a front door panel and also a rear door panel. The zips on front and rear are configured such that by detaching the front panel of one and the rear panel of another, two bike tents can be zipped together to extend the size. The following video is a quick demo by Pete in our warehouse showing how to attach and detach the door panel. 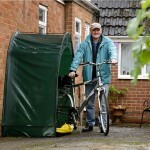 5 reviews for Bike Cave – bike tent – bike storage shelter – new improved design! I just wanted to say that I wasn’t quite convinced at first about the Bike Cave. I bought one and put it up in my garden. It’s amazingly strong. It has put up with being buried in snow drifts, battered by winds and storms (we live in the highest village in Kent)and I now have to say that I am impressed. So impressed that I have bought another one. My bike cave has also been on holiday with us to the South of France and been put up an down for two weeks with no problems at all. I would recommend it to anyone. It is also much more cost effective than buying one of those £600 bike storage boxes available at B&Q for example. I bought one of your wonderful bike caves about 3 years ago. I am very pleased with the way it has kept my husband and my bikes nice and dry all this time – so much so, that I’ve just bought one of your Xtra extension modules to create more space to keep our son’s bike in there too. Really excellent service from your customer services team – arrived next day – many thanks. Thank you to the team at Cave for great service. My Bike Cave arrived very quickly. Easy to put up and it swallowed our two bikes easily. Been up for about 3 months now and has withstood all that nature can throw at it including a few gales. Really like the storage for our bikes. Works great. Only recommendation would be to have more detail for assembly as you include more parts than you give instructions for. The cloth tabs in the front are wearing after 3 years only left out in the summer. Would order again.